Enbridge’s stock price were down 4.7 percent this morning, following the release Monday of an Administrative Law Judge’s recommendations on the Enbridge Line 3 tar sands pipeline through northern Minnesota. Judge Ann O’Reilly released her 370-page report on Monday, rejecting Enbridge’s preferred new route, but allowing the pipeline to move forward under certain conditions. Her report apparently worried financial markets about the project’s viability. According to the Reuters story: Enbridge shares fall on Minnesota pipeline route ruling. … the project has run into opposition in Minnesota from the state, along with Native American tribes and environmental activists who have questioned whether the replacement is needed. Truth be told, Line 3’s supporters and opponents are still scratching their heads to figure out the impact of O’Reilly’s recommendations. One thing is clear, O’Reilly was listening when Line 3 opponents criticized Enbridge’s tactics of calling its new Line 3 proposal a “replacement project” when it’s anything but a replacement project. Enbridge’s current Line 3 is old and failing. Enbridge’s “replacement project” sought to abandon the old Line 3 in the ground and to build a new and larger Line 3 along a new route. O’Reilly’s recommendations make Enbridge live up to the term “replacement,” at least in part. They say the only way the project would meet a cost-benefit analysis — and justify a Certificate of Need — would be if the company removed the old Line 3 from its existing trench and used the same trench for the new Line 3. That is — to actually do something closer to a replacement project. Still, O’Reilly’s recommendations fall short of making this a true replacement project; they allow Enbridge to replace the old Line 3 with a larger pipeline. For more on O’Reilly’s recommendations, see yesterday’s blog: Line 3 Recommendations Puts Burden to Stop Line 3 Squarely on the Ojibwe. 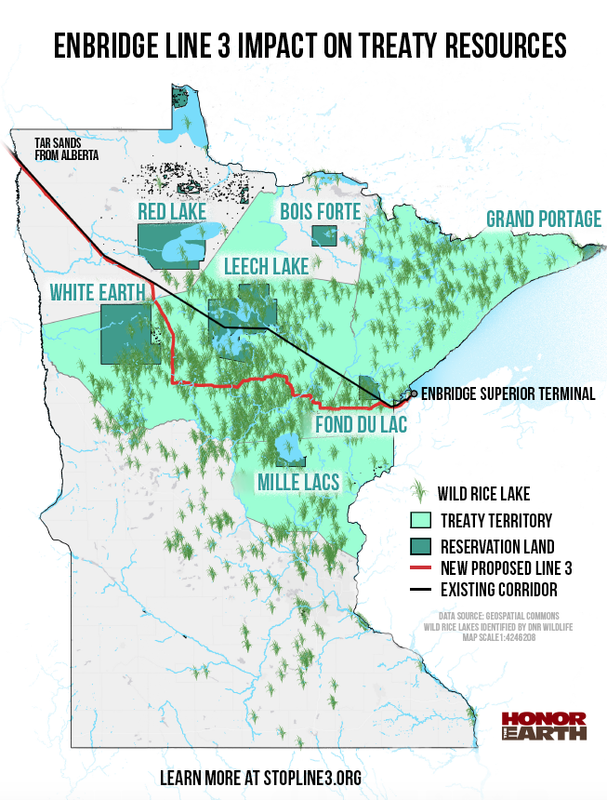 O’Reilly’s recommendations now go to the Minnesota Public Utilities Commission (PUC), which is expected to cast final votes in June on Line 3’s Route Permit and its Certificate of Need. Enbridge insists on calling this large new pipeline, in a new corridor, with the ability to carry new product and nearly twice as much of it, and a larger diameter a “replacement.” The proposed Project is in every way a new pipeline and treating it as a replacement is inappropriate unless the applicant purports to remove and replace the old Line 3 pipeline. Enbridge’s continued euphemistic assertion that this Project is a “replacement” is simply a marketing ploy and legal framing, but when the basic facts are acknowledged it is a demonstrably false narrative. THEREFORE, BE IT RESOLVED, That the Leech Lake Tribal Council does hereby give notice to all Minnesota State and Federal government entities to remove Line 3 off the Leech Lake Indian Reservation, effective immediately. That the Leech Lake Tribal Council will not approve a route across the Leech Lake Indian Reservation.